For other uses, see Domestic (disambiguation). Domestiques from several teams form lines at the front of the peloton to keep their leaders near the front of the race. Note George Hincapie working for his team leader Lance Armstrong, visible in the yellow jersey of the Tour de France. In road bicycle racing, a domestique is a rider who works for the benefit of his or her team and leader, rather than trying to win the race. In French, domestique translates as "servant". [n 1] The use of the term dates back to 1911, although such riders had existed before then. Much of a cyclist's effort is to push aside the air in front of him. Riding in the slipstream of another rider is easier than taking the lead. The difference increases with speed. Racers have known this from the start and have ridden accordingly, often sharing the lead between them. From there it is a small step to employing a rider to create a slipstream while his leader rides behind him. More complicated tactics become possible as the number of domestiques available increases (see below). Where the domestique finishes a race is less important than the help he gives. During their role as domestiques, riders do not share the fame of leaders such as Eddy Merckx, Bernard Hinault or Miguel Induráin. It is team tactics which so often win or lose races - and the lieutenants and the dog soldiers who expend their energy blocking chasing moves when they have riders up the road in a position to win. It is they who ride out into the wind so their aces can get an easier ride tucked inside their wheel [close to the rider in front and in his shelter]. Rare indeed is the major victory that cannot be credited in large part to the groundwork laid by the domestiques. The first riders known to have been employed to help a leader were Jean Dargassies and Henri Gauban. They rode in the 1907 Tour de France for Henri Pépin, who promised them the equivalent of first prize if they would pace him from restaurant to restaurant. The three never hurried. They took 12 hours and 20 minutes longer than Émile Georget on the stage from Roubaix to Metz – they were far from last – and the judges were powerless because the race was decided not on time but points. It mattered less what speed riders competed than the order in which they crossed the line. In an era when riders could be separated by hours, there was no point in hurrying after a rival who could not be caught and passed. The judges had to wait for everyone. The rules of the Tour in its first decades forbade team riding but Pépin did little to affect the result. He dropped out on stage five. The word was first used in cycling as an insult for Maurice Brocco, known as Coco, in 1911. Brocco started six Tours de France between 1908 and 1914, finished none of them, although a stage he won in 1911 caused the coining of domestique. Brocco's chances in 1911 ended when he lost time on the day to Chamonix. Unable to win, the next day he offered his services to other riders, for which he had a reputation. François Faber was in danger of being eliminated for taking too long and the two came to a deal. Brocco waited for Faber and paced him to the finish. Henri Desgrange, the organiser and chief judge, wanted to disqualify him for breaking the rules. But he had no proof and feared Brocco would appeal to the national cycling body, the Union Vélocipédique Française. He limited himself to scorn in his newspaper, L'Auto, writing: "He is unworthy. He is no more than a domestique." Next morning Brocco greeted Desgrange with: "Today, monsieur, we are going to settle our accounts." He won the day by 34 minutes. Desgrange followed him and the yellow jersey, Gustave Garrigou, as they climbed the Tourmalet. "So, am I forbidden to ride with him?" Brocco shouted. On the following mountain, the Aubisque, he dropped Garrigou, passed Paul Duboc, who had been poisoned and was in agony beside the road, and took the lead with Émile Georget. Desgrange was still watching. "Alors, quoi", Brocco shouted, "do I have the right to stay with him?" And then he rode off alone and won. He had made two points to Desgrange. The first was that he was a talented rider and not a servant. The second was that he had so much talent that his poor riding with Faber could only have been through a commercial arrangement. Desgrange replied that any rider with such flair had clearly been selling the race. "He deserves his punishment", Desgrange wrote, "immediate disqualification." Domestiques had long been accepted in other races. Desgrange believed the Tour should be a race of individuals and fought repeatedly with the sponsors, bicycle factories, who saw it otherwise. Desgrange got rid of the factories' influence only by reorganising the Tour for national teams in 1930, with the effect that he thereby acknowledged teamwork and therefore domestiques. Vin Denson rode for Rik Van Looy. "You did whatever he wanted, including the fetching of beers, which he had a great fondness for in mid-race. Domestiques were reduced to chasing long miles to bring the great man a bottle of Stella". The dominant climber of the 1950s, Charly Gaul, was followed for as long as he could last by Luxemburger Marcel Ernzer. The two men were of similar size and rode bikes of exactly the same dimensions, even though that made Ernzer a little low in the saddle. He was always there to give his bike to Gaul when it was needed. Andrea Carrea was a domestique for Fausto Coppi. "He was a gregario par excellence", said the journalist Jean-Luc Gatellier, "the incarnation of personal disinterest... showing to perfection the notion of personal sacrifice. He refused the slightest bit of personal glory." Carrea was riding the Tour de France of 1952 and joined an attack to Lausanne to protect his leader's interests. Carrea said: "Without knowing it, I had slid into the important break of the day and at Lausanne, to my great surprise, I heard I had inherited a jersey destined for champions. For me, it was a terrible situation." Carrea had no idea he had become race leader. When officials told him, he burst into tears. He had ousted Coppi and he dreaded the consequences. He wept as he received his jersey, looking constantly down the road for the main field that included his leader. Coppi said: "I wondered how Carrea, so shy and so emotional, was going to take it. When I went to congratulate him on the track at Lausanne, he didn't know what face he ought to adopt". A domestique retrieving water for his teammates. Domestiques bring water and food from team cars and shield teammates from opponents. They help teammates with mechanical disasters – should the leader puncture a tire, the domestique will cycle in front to create a slipstream allowing him to reclaim their position. A domestique may also sacrifice his bicycle or wheel. Domestiques lead out sprinters by letting them 'draft' behind to conserve energy until the last few hundred meters. The lead-out train sometimes starts 10–15 km to the finish with up to eight domestiques setting a pace to discourage others from breaking away. One by one, worn-out teammates drop off. The last to lead a sprinter is often a good sprinter himself. The sprinter will launch into a dash to the line with one or two hundred meters to go. In mountainous races, domestiques help their leaders by setting a pace or thwarting attacks from others. 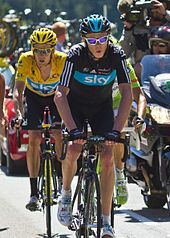 Chris Froome assisting Bradley Wiggins (yellow jersey) in the 2012 Tour de France. Froome went on to win the 2013 Tour de France. There is a hierarchy among domestiques; the more accomplished, often called lieutenants or super-domestiques, are called upon during critical times. The lieutenant(s) stays with the leader as long as possible during demanding periods. For example, Lance Armstrong used teammates to set a pace during mountain stages of the Tour de France before a decisive attack. Examples of super-domestiques are Andreas Klöden (Astana) and George Hincapie (Team BMC) in the 2009 Tour de France and 2012 Tour de France runner-up Chris Froome (Team Sky). Domestiques sometimes get a chance to win stages in stage racing. Typically this would be late in a stage race. Domestiques whose standings do not threaten the leaders will often not be chased if they break away. Domestiques can progress to more senior roles if they show ability. For example, at the 2012 Tour de France Tejay van Garderen of BMC Racing Team began the tour as a domestique for 2011 winner Cadel Evans but later became team leader due to Evans struggling and eventually won the young rider classification. Chris Froome of Team Sky also won a stage while riding in support of winner Bradley Wiggins, and became team leader the following year, where he eventually won the general classification. Assigned team roles vary substantially from race to race based on a variety of factors, including the course, the team members riding the race, their current physical condition, or even commercial factors. For instance, Stuart O'Grady, a veteran professional rider riding for Leopard-Trek, served as a domestique supporting Carlos Sastre in the 2008 Tour de France. By contrast, in the 2008 Herald Sun Tour, a much less-prominent race in which Sastre (and other high-profile members of the team) did not ride, the Australian O'Grady acted as team leader and was assisted by his teammates to win two stages and the general classification. The UCI points system changed the relationship between domestiques and leaders. Previously, domestiques were not concerned with their finishing order. However, riders now get points for their finish position. This presses domestiques to also consider their own performance in addition to their leader's. The 1990s saw the introduction of radio communication, allowing managers to assign tasks to domestiques wherever they are on the road. The influence of radios on race tactics is a topic of discussion amongst the cycling community, with some arguing that the introduction of radios in the 1990s has devalued the tactical knowledge of individual riders and has led to less exciting racing. In September 2009, the Union Cycliste Internationale (UCI), the governing body of pro cycling, voted to phase in a ban on the use of team radios in men's elite road racing. Finally radio found its undisputed place in peloton for good and, as some races with imposed radio ban proved, the ban changed nothing in racing tactics. In track cycling's team pursuit event, a team of four riders must complete 4 km, with the third rider being used to stop the clock. Therefore, one rider often sprints towards the finish line to tow the teammates. ^ However, in French, the term used is équipier. In Italy and Spain, the term used is gregario (meaning "soldier of the Roman legions" or "one of the group", see etymology). In Belgium and the Netherlands the term knecht (meaning "servant" or "helper" in Dutch) is used. ^ "Radio killed the tactical star". Cycling Central. BBC Sport portrait of domestique Sean Yates. The Guardian article on domestiques at the Tour de France. This page was last edited on 5 November 2018, at 11:37 (UTC).